All hell has broken loose in happy-happy-forever-after land. Peter Pan is addicted to the Internet, Sleeping Beauty is battling depression, Cinderella’s photography isn’t selling, and Mulan has decided to become a boy. 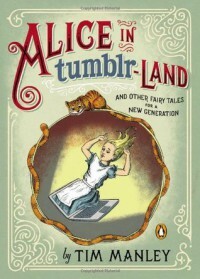 Fans of Tim Manley’s blog Fairy Tales for Twenty-Somethings will find plenty to enjoy in ALICE IN TUMBLR-LAND. Included are over 200 carefully edited entries following Manley’s usual cartoon-text format. Maybe about a tenth of this book has already been seen in his blog, but many of those have been updated—both text and illustration. For the most part, Manley’s most original and most humorous efforts have been reserved for the publishing of this book. The editing team has done an an excellent job in arranging these panels in a coherent, chronological order. As with any comedy, it’s best to keep the punch line a surprise. For newcomers to Manley’s work, you can either check out his blog or the three panels that Amazon has posted in the preview. Each page holds an illustration followed by text, both working together to tell twisted, adult-themed mini-stories revolving around a classic Disney and fairy tale character. Millennials and Generation Y’s will especially appreciate the humor that incorporates not only web-based technologies (Siri, Twitter, Facebook), but also many of the pop cultural references (YOLO, dubstep, Gangnam style). Considering this, the humor may be lost on some older readers unfamiliar with these terms. Any newcomer should be aware that the book contains a few F-bombs (four to be exact). If I had to recommend a version of this book to buy, I would vote for the hardbound book. This is something that can be set out inconspicuously on a coffee table prior to company arriving, causing someone to pick it up, and spread the humor about. Some folks may decide to keep this in the bathroom or bedside, where it is perfect for abbreviated reads and quick bursts of laughter. As for the Kindle edition, I’m not sure if it is just my preview copy or my font size, but the pictures didn’t line up on the same pages as the text. More noticeably, the beginning letter of each story was on a different line, many times on the page prior. I was still able to comprehend the associations and enjoy the content despite those small electronic hiccups. I would like to give a special “thank you” to Penguin Books for providing me with a digital review copy of this book.